We use only the best materials in the market! Choose between the Woven & Non-Woven material to find the mural that fits your needs and budget. 100cm (W) x 70cm (H) - 2 Stripes 150cm (W) x 105cm (H) - 3 Stripes 200cm (W) x 140cm (H) - 4 Stripes 250cm (W) x 175cm (H) - 5 Stripes 300cm (W) x 210cm (H) - 6 Stripes 350cm (W) x 245cm (H) - 7 Stripes 400cm (W) x 280cm (H) - 8 Stripes CUSTOM SIZE AVAILABE AS FOLLOWING: Width - MAX 420cm Height - MAX 300 cm CHOOSE THE BEST METERIAL FOR YOUR NEEDS. Woven Wallpaper - FABRIC Self Adhesive sheets, NO GLUE NEEDED, completely removable. Non-Woven Wallpaper - Vinyl Self Adhesive sheets, NO GLUE NEEDED, Strong adhesive. For newly painted walls - Please allow 3-4 weeks before applying. Photos are for illustration purposes only. To ensure the best quality in the market - We will print your wallpaper as soon as your order is received - No stock items. Wallpapers will be packed & rolled inside firm mailing tubes for best protection of your item. Important Points To Be Aware Of: Colors can vary from one computer to another. New items will be added almost every day. Please be sure to check up for updates. Make sure you read the item description to avoid any misunderstandings. We aspire to your complete satisfaction. We are here for you at any time, for any matter. We will reply within 24 hours. Auctiva offers Free Image Hosting and Editing. 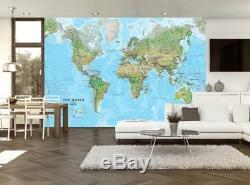 The item "World Map Wallpaper Woven Self-Adhesive Wall Art Mural Decal M248" is in sale since Tuesday, May 8, 2018. This item is in the category "Home, Furniture & DIY\DIY Materials\Wallpaper & Accessories\Wallpaper Murals".